Mmm!!! 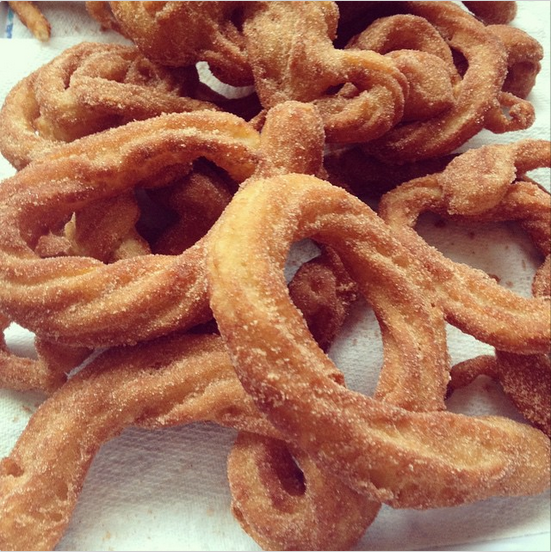 Super tasty home made churros! Genuenly one of the easiest treats I’ve ever made. Thanks to a combanation of ChocolateChocolateandMore and a few little online hints, I managed to make scrumtious churros first time round! It’s much easier if you prepare everything to begin with, trust me! Pour your oil into a pan for frying, or if you have a deep fat fryer use that. Line a baking tray with kitchen roll for draining. Mix the sugar and cinnamon for coating and place in a deep dish/ plate. Also assemble a large piping bag with a star nozzle. Place the butter and water in a medium-sized pan and boil till mixed. In a heat proof bowl, place the salt, flour and 1/2 tsp cinnamon. Pour the butter/water into the bowl and with a hand mixer combine them to a dough. Add the eggs and wisk until smooth. Be ready to drain the churros on your baking tray and remember this is a runny dough, so when you’re not using the piping bag rest it in a glass or hold it in your hand upside down, just don’t let it run! Pipe the dough into the oil whatever shape/length you want. When you see the edges become golden turn the dough until all golden/brown. Quickly remove from pan onto the tray. Roll the warm churros in the coating until completely covered.